I have problems installing the game. What’s going on? On certain devices/Android OS versions, there’s a problem when installing the game to the SD card. This is true especially if you’re seeing the ‘Unknown Error 18’ when installing the game, or updating it. To fix it, there are two options: the hard way, which fixes this for good, and the easy way, which you have to do each time you install an app. 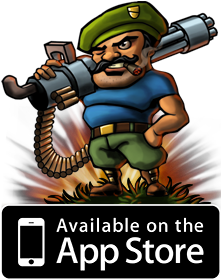 Guerrilla Bob runs on all Android devices with OS version 2.0.1 and above. The only exception is the Samsung Galaxy S phones. 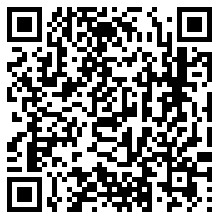 If you have one of those, Guerrilla Bob will only work on Android 2.2 and above. If you’ve got any of those devices, Guerrilla Bob will work 100%. 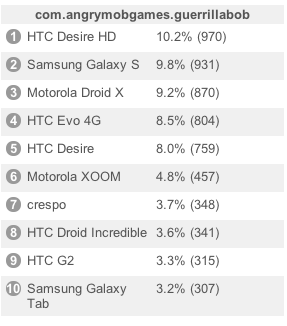 There are lots of new Android devices coming out in 2011. 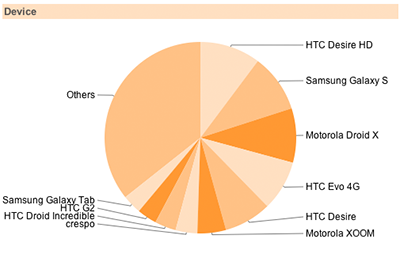 As far as we know, they’re all supported, as they’ve got great tech specs, and they run the latest Android OS. You’ll get a great experience playing Guerrilla Bob on them. What are the unsupported Android devices? Some Android devices don’t have Floating Point or Vector Units, so our game engine can’t run on them. How do I play a multiplayer game? Multiplayer works by connecting two devices on the same local area network. Online multiplayer is not supported right now. You'll be able to connect your device to an iPhone, iPod touch, iPad, Android device, PC or Mac. One of the devices should be the server, and start the game. You can select either 'Multiplayer->New Game', or 'Multiplayer->Load Game'. The other device should select 'Multiplayer->Join'. The server should automatically appear on the hosts list, once it's created. If it doesn't show up, you could press 'Manual Connect', and enter the server IP. You can find that one by pressing the 'Server Info' button, on the server device. Once you're connected, the server selects the level, and you can start playing.